When John Watson of the AJC called Bocado’s burger the “Best Burger (Stack)” in April’s Spring 2011 Dining Guide, I thought Bocado might be a restaurant to add to the list. But then when Creative Loafing included the burger in its “100 Dishes to Eat in Atlanta Before You Die” round-up, I knew I had to. Cliff’s review didn’t hurt my craving, and neither did Evan’s over at Patagonian Toothfish. So yesterday, when I ended up at Bocado for lunch, it wasn’t really a surprise. I hadn’t planned out the week’s meals or anything, but Bocado was a natural since it’s a mere mile or so up Marietta from the swank conference hotel I’m calling home thanks to G’s Microsoft TechEd Conference and his company’s generous purchase of a room for him (us) for the week. 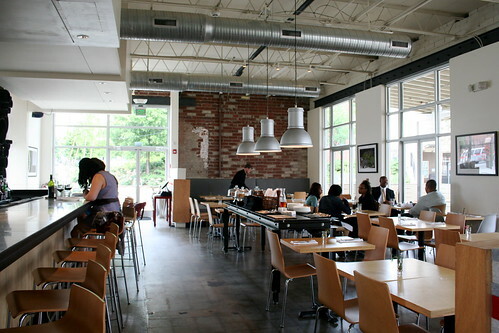 And the fact that it’s directly across Howell Mill from Octane sealed the deal. 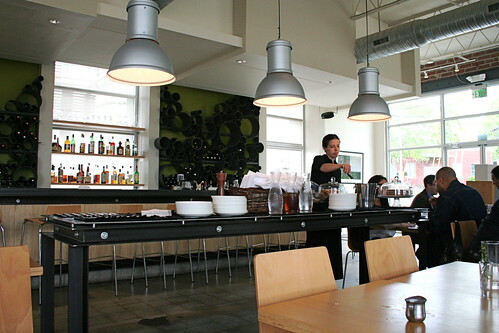 Lunch and then coffee and work (I’m working remote all week) at Octane. Sounds like a plan. When I arrived at the restaurant, the first thing I noticed was the lack of a place to lock my bike. It’s really my only complaint about the experience. Not even a street sign could be found close to the building. I thought about walking across the street to Octane to lock it in the bike rack, but decided to chain it to a handrail next to some steps. Not a huge issue, but it’s always nice to see restaurants that welcome bike customers in addition to those driving. Especially since that part of Atlanta (Westside) is so bike friendly with tons of bike commuters! Entering the space, I felt immediately at home: light, airy, industrial feel with loads of windows, a huge patio out back that would have been lovely if it hadn’t been raining that day, a long, dark bar, and a a servers’ table in the middle with extra plates, cutlery, water & tea, and cakes. I love it when cakes are central! Large modern art adorned the walls between windows, and light birch tables opened up the room even more. While I already knew that I would order the burger, the other lunch items were tempting, from a poblano and cheese sandwich to a roasted cauliflower sandwich (I can’t grab the details since the website seems to be down). 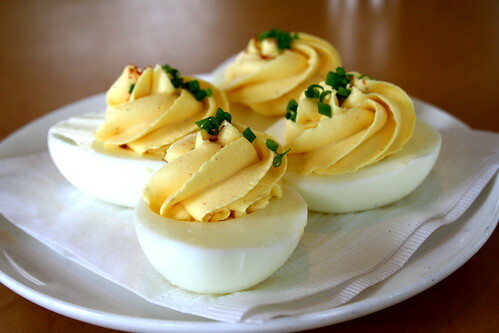 The greedy eater that I am, and a woman addicted to deviled eggs, I had no choice but to order an appetizer of the little yellow and white nibbles. Prepared fairly standard, the eggs were simply topped with some fresh chives and a sprinkling of Spanish paprika, but from the bright and beautiful color of the yolk, I’m guessing the eggs are probably locally sourced. With in-house mayo, you can’t beat them. The slight acid in the mayo balanced well with the rich oil and fat of the eggs and, thankfully, they weren’t too salty, just salty enough. I love me some deviled eggs. But then, the burger. I’m a Holeman & Finch fan myself, and the foie gras burger in Philly definitely won my heart too. Those burgers, though, are thick burgers–burgers that pride themselves on medium cooking, juicy slabs of meat, and plenty of toppings. 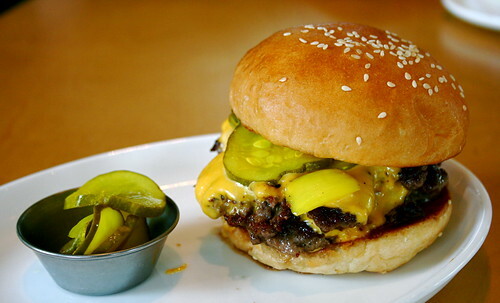 Bocado’s burger, as a stack burger, takes an alternate approach and focuses on the basic necessities: meat, bun, cheese, pickles. The beef is sourced from a local farm (I forgot to grab the details) and the cheese is plain ol’ American Cheese. The pickles, however, are some nice sweet and sour pickles–just pickled in a bit of sugar and vinegar (probably apple cider if any of my pickling experience of the last year has taught me anything). Keeping everything plain that way, the quality of the meat shines. I felt a little embarrassed eating it, in the fact that I made quite a mess with the juice of the meat dribbling all over my hands and my face, my bike back sitting on the chair in front of me. Oh yes, I was a lady who lunched. Just me and my bike bag and my camera and my burger. Funny looks? Not to many. I actually love eating alone, and lunch alone at Bocado meant I got the burger and deviled eggs all to myself–certainly nothing I’m complaining about! A few pickles were served along with the burger and I was more than happy to alternate carnivorous chomps at the burger with dainty nibbles at pickles, sips of unsweet tea (yes! unsweet! I’ve never liked sweet tea, bad Southerner that I am) between. The burger definitely meets all the hype–for a stack burger, at least. I could eat it any day, though I think my waistline wouldn’t agree with that statement. Comparing it to Holeman & Finch’s burger, though, is like apples to oranges–it’s a different beast all together. But a delicious beast nonetheless. Ok, I have to say that although I’ve never been to Atlanta (apart from a few hours of abject boredom in the airport), I totally want to go! Everything sounds DELICIOUS, & the minimalist industrial business is so nice.